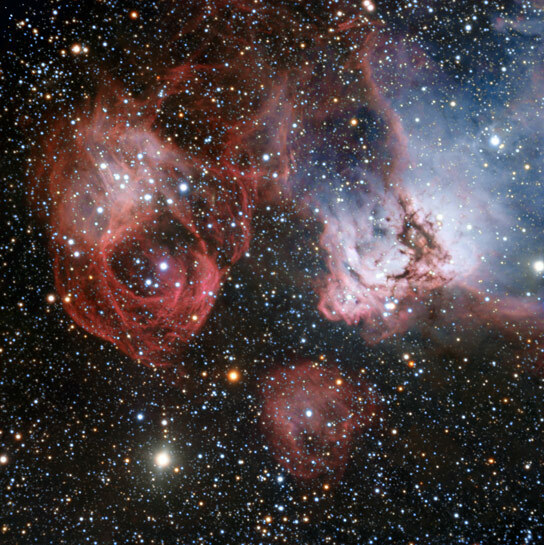 A new ESO image explores the Large Magellanic Cloud and an area nicknamed the Dragon’s Head Nebula. Located only about 160,000 light-years from us in the constellation of Dorado (The Swordfish), the Large Magellanic Cloud is one of our closest galactic neighbors. It is actively forming new stars in regions that are so bright that some can even be seen from Earth with the naked eye, such as the Tarantula Nebula. This new image, taken by ESO’s Very Large Telescope at the Paranal Observatory in Chile, explores an area called NGC 2035 (right), sometimes nicknamed the Dragon’s Head Nebula. The filamentary shapes to the left in the image are the not the results of starbirth, but rather stellar death. It was created by one of the most violent events that can happen in the Universe — a supernova explosion . These explosions are so bright that they often briefly outshine their entire host galaxy, before fading from view over several weeks or months. This image was acquired using the FOcal Reducer and low dispersion Spectrograph instrument attached to ESO’s Very Large Telescope, which is located at the Paranal Observatory in Chile, as part of the ESO Cosmic Gems program . 1 Comment on "ESO’s Very Large Telescope Views the Dragon’s Head Nebula"
My grandson is 10 years old and has a persuasive writing assignment to sell an object from space. He was allowed to choose from planets, stars, comets, moons, satellites, nebulas, dwarf planets and asteroids. After doing research, he chose the Dragon’s Head Nebula as his subject matter, because of it’s beauty and expansiveness.